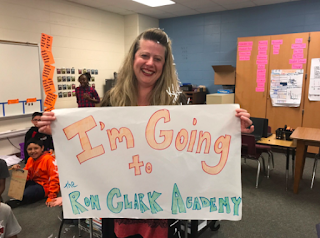 This January, my life took an exciting twist when I found out I would be attending a fast and furious trip to the Ron Clark Academy in March. I had heard Ron speak when I lived in South Carolina, and I followed Kim and Hope's adventures on Twitter, so I was excited to see the school of these amazing educators. I don't think anyone can fully expect what they will experience when they walk into the doors of this amazing school! From the genuine smiles and greetings of the students along our walk into the school, to the well versed, engaging students we conversed with as we waited for the beginning of our day, I was impressed beyond measure before even hearing from the school leaders. Throughout the day, we rotated through various classes to experience the different teacher's styles and observe the students actively engaged in the learning process. One of my favorite classes was Ron's math class. So much learning took place without even talking. Through music and hand signals students lead a type of learning conversation I had never experienced before and with each minute, I furiously cataloged what I was experiencing so I could use this type of engagement in my classroom! I had taught my students to defend the reasoning behind their answers, but this approach would take my students to a whole different level of communication and learning! When the conversation did begin, I heard students passionately sharing their thinking and reasoning not only defending their logic but also explaining their wrong thinking and how they corrected it. I heard about "conceding" to one another as students demonstrated a genuine care for listening yet questioning ideas being communicated by each other. I was hooked! What I saw in this classroom was not just another experience I would have in my repertoire of observations, but I was going home to teach my students how to learn and communicate their learning this way. Then it happened! We earned the privilege of the red buzzer. One of the students excitedly invited me, "Come dance on the tables with us!" I didn't need a second invitation, I was hooked! With the deep satisfaction of helping the students accomplish their goal and joining in the celebration of learning, I was ready to dive in with everything I had...I didn't care what anyone thought! During the high of the celebration, I remember thinking, "OMG, what it would be like to teach at this school! It fits me!!!" Unharnessed passion and enthusiasm was the norm and while I knew what that was like to experience on my own, I had never been in a school where it was a norm not only for the teachers, but also the students! Throughout the day, I soaked in every experience, meeting and talking with the teachers and taking in their words of wisdom and advice. By the end of the day, I was ready to sign up. I didn't think they would ever have any teacher position openings...who would ever want to leave this school. Then I thought, "But hey, what would it hurt to ask." I found one of the ladies in charge and asked her. She said, "Watch social media for postings." Well, I certainly could do that and even if it took several year, I was going to apply when they had their next opening! While the slide certification was amazing, even more thrilling was the music, dancing and the houses sharing their team spirit! It took me back to my past 10 summers with the Brooklyn Tabernacle Kids Ministry where we cheered, sang and danced our hearts out to engage students in understanding the passion Jesus has in loving them no matter what! I think the older I get, it's extremely difficult to find settings where passion and enthusiasm are the norms. God has given me a driven personality that thrives on sharing my high energy and enthusiasm to invigorate those I come in contact with. I want to inspire others to take their enthusiasm to the next level, and I want my passion for living to be infectious to anyone I come in contact with! When the end of our day came, I didn't want to leave till the very last minute...I wanted to soak in every aspect of what I had just experienced. Throughout the next couple day after the trip, I considered how I would enact change in my classroom because of my visit to RCA. I would definitely be getting a drum for my class. Music would become even more of an important part of my classroom. My students would learn to hold conversation of explanations challenging each other with their ideas and mistakes as part of the learning process modeling the give and take of concession. So many things to consider, and even though it was spring break after my visit, I still wanted to get back to my classroom and get started. My standard of performance and expectation for myself and my students had been raised to a new level of challenge that I couldn't wait to enact! I am deeply grateful to my school and principal for the experience of going to RCA! I consider myself a driven, passionate person, but it was so amazing to see other individual even more driven and enthusiastic than myself. I now have a new standard to look up to and emulate as I continue to grow and challenge myself personally and professionally!